Recently I got to go see my friend Gloria at her home in Philadelphia. She tried to show me as much of her beautiful, exciting city as possible. She knew that I like history so we went to see a lot of the historic sites, but we also took a day and went "down the shore". It was funny to hear her say that, but I learned that in the Philadelphia and Southern New Jersey area, they do not call it going to the beach. They go down the shore. 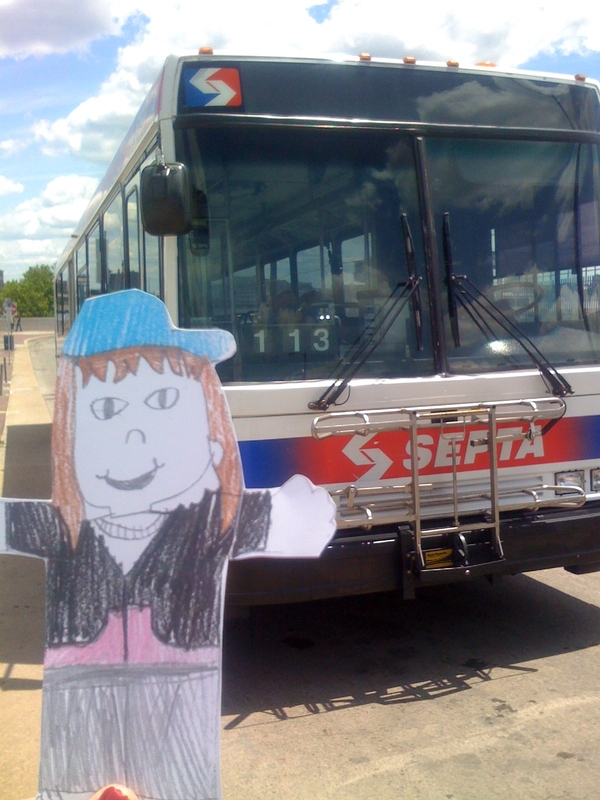 We took the bus the Philadelphia Art Museum. It was such a nice day that we decided not to spend the day in the museum. Gloria told me all about the beautiful paintings and sculptures and I want to go back and see it another time. It was fun seeing the outside of the Art Museum because the steps are famous. They are the steps that Rocky ran up in the movie. 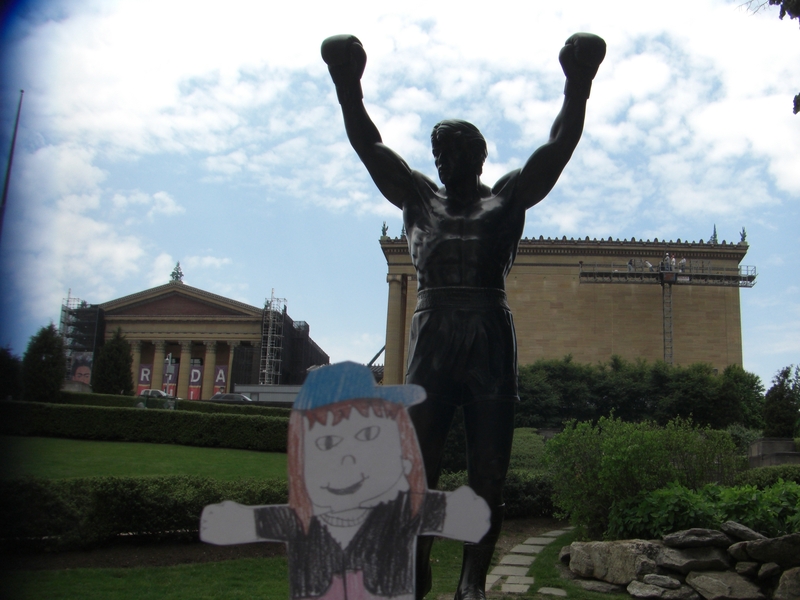 I also got to take my picture with the Rocky statue. 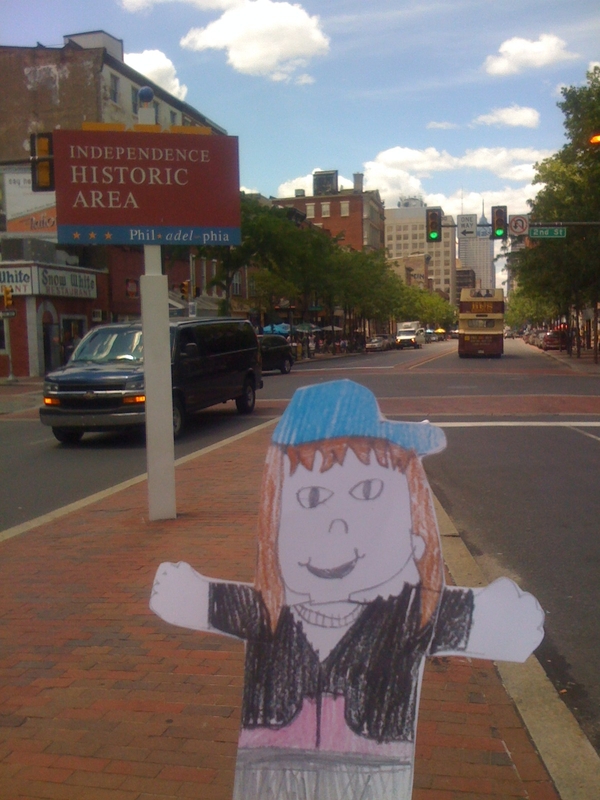 We walked back into Center City (downtown) on the Benjamin Franklin Parkway. It is very pretty with parks and fountains along the length. It is also a very good spot to see the Philadelphia skyline. See how pretty it is. Our walk down the Parkway took us through Center City and into the historic part of Philadelphia. This area is called Old City because it is where the city originally started. Several of the buildings are over 200 years old and there are even some streets that still have cobblestones. Philadelphia is an interesting city because there will be a little tiny very old building right next to a big skyscraper. We started our tour of the historic district at Penn's Landing. 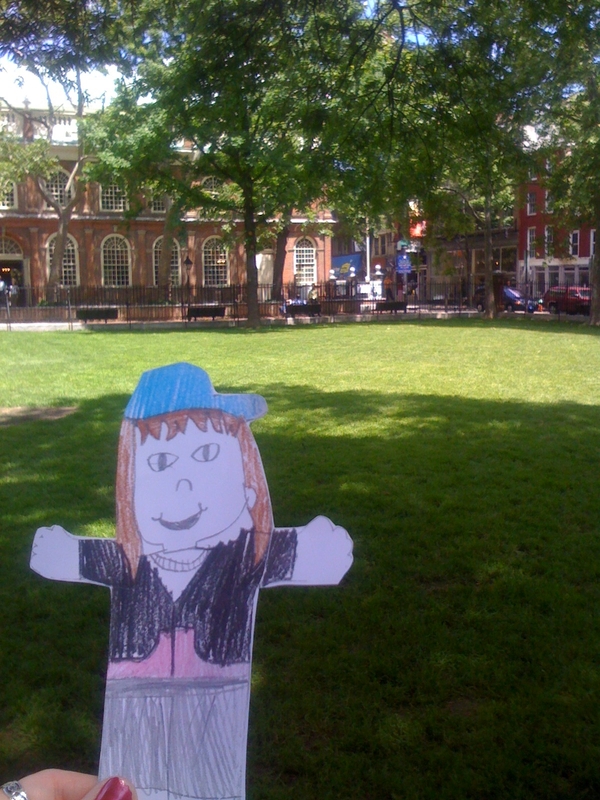 This is the spot where William Penn landed when he came up the Delaware River and established the city of Philadelphia. From Penn's Landing you can see the Benjamin Franklin Bridge. It was the first bridge that crosses the Delaware River between New Jersey and Philadelphia. 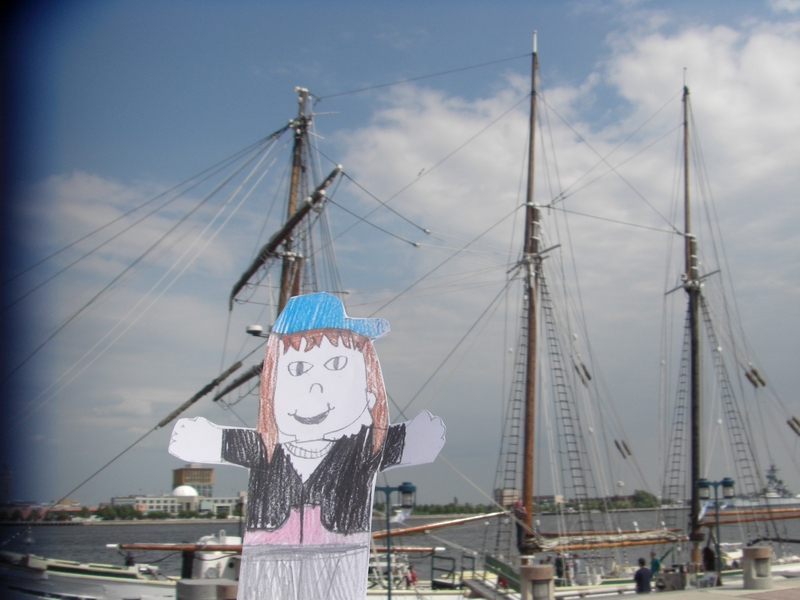 Also at Penn's Landing, I got to see the Tall Ship Gazella. The ship is very pretty with its very tall masts and sails. There is a group in Philadelphia that works very hard on preserving the original ship. It was very interesting to find out that they still sail this ship even though it was built in the 1800's.
. From Penn's Landing we crossed a bridge over the highway onto Market Street. 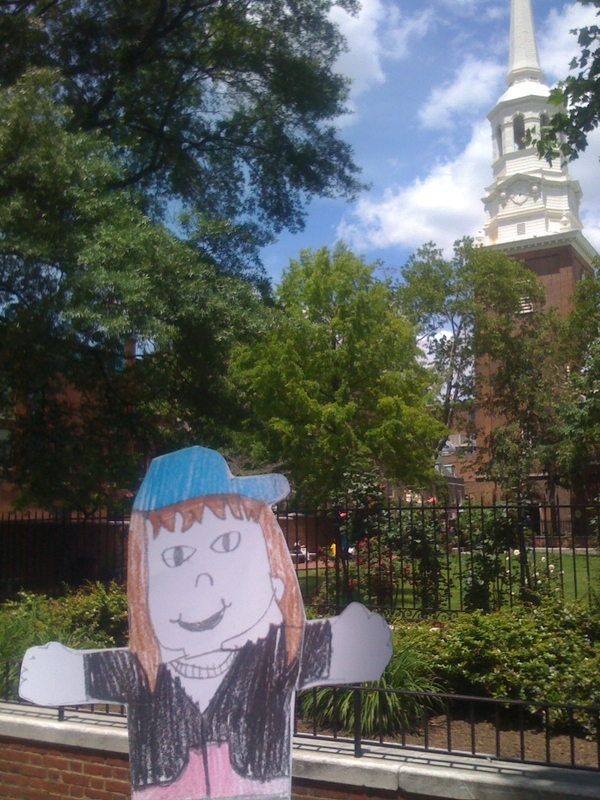 This led us into Old City and we started exploring all of the historic sites. Gloria was very nice and explained all of the history to me while we "playing tourist" as she called it. the city. We visited one next to Christ's Church. Christ Church was founded in 1695.
inhabited residential street in the country, There are people who still live there now. 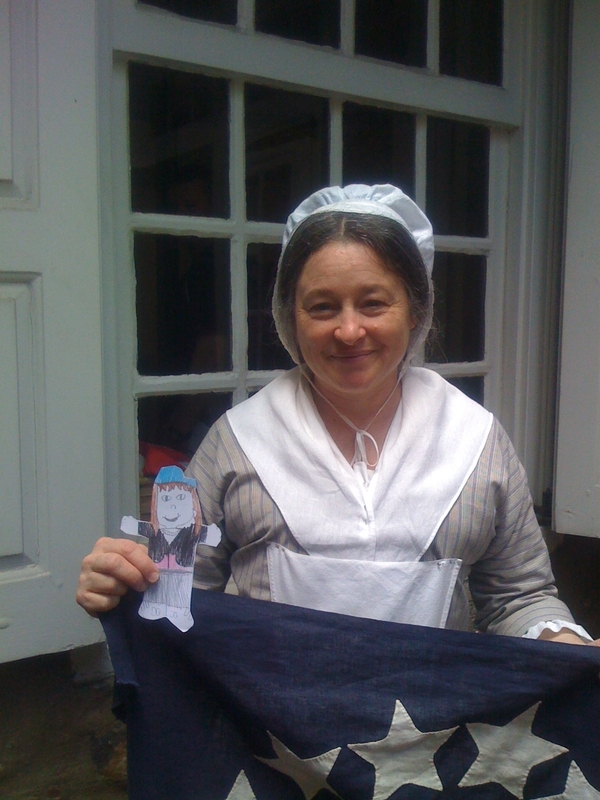 short people like Gloria and I.
Colonial lady named Mary who showed me how to knit. 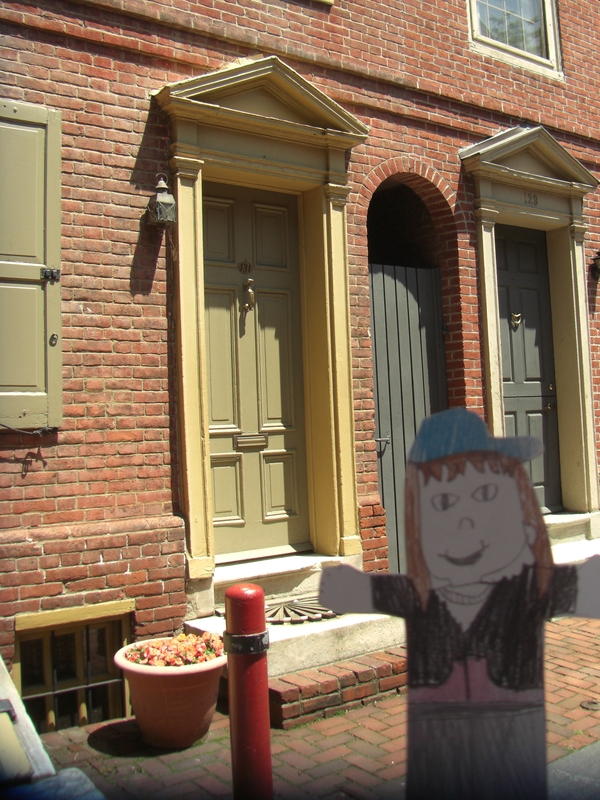 Just down the street from Betsy Ross' house is the Christ Church burial yard. 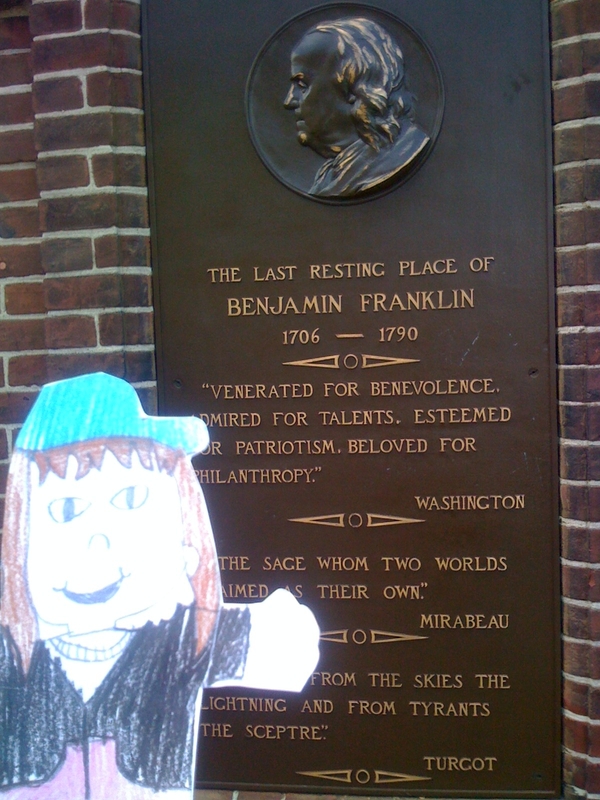 It is were Benjamin Franklin is buried. 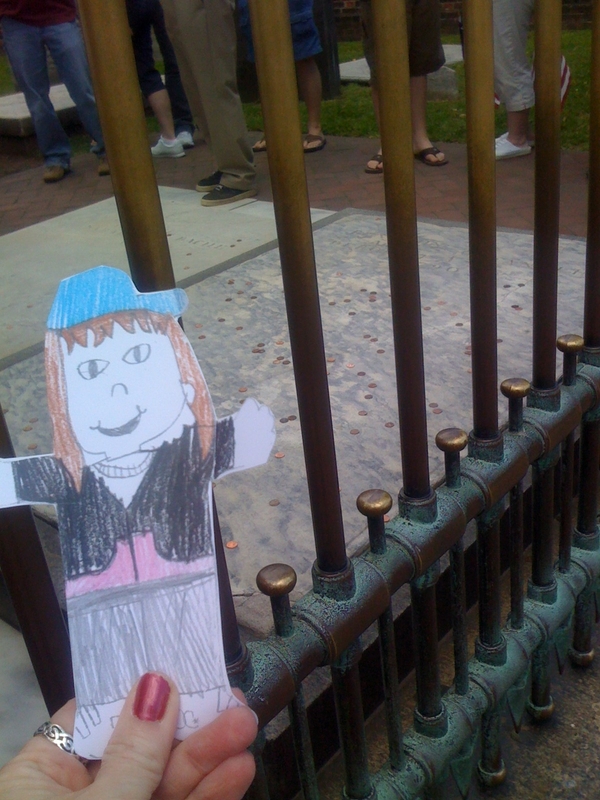 In my picture you can see the pennies that people throw on his grave for good luck. Gloria says it is kind of funny that they do that since Ben Franklin is the one who said a penny saved is a penny earned. Across the street from the cemetary is the Free Quaker Meeting House. A meeting house is the Quaker version of a church. It also served as a community meeting hall. 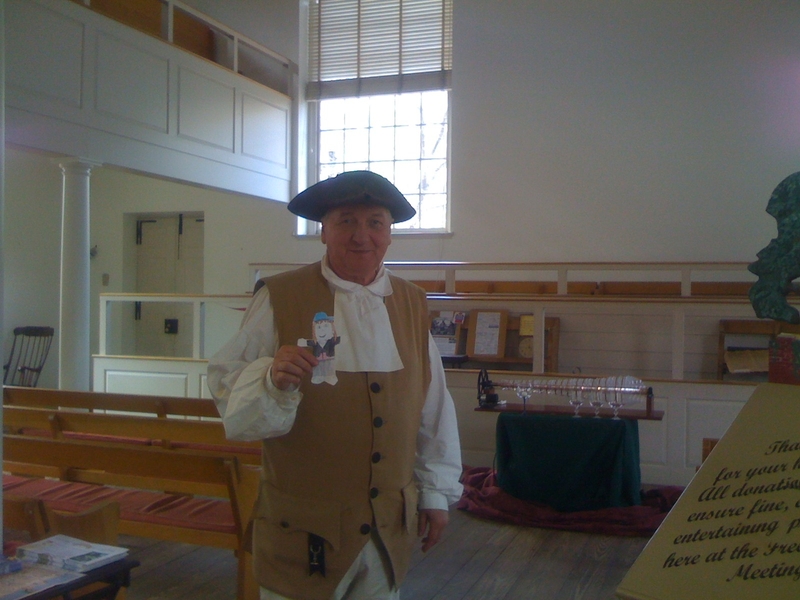 There was a very nice man named William who was telling everyone about the meeting house. He showed me how to play the glass armonica (no, I did not mis-spell it) that you can see in my picture. The glass armonica was one of Ben Franklin's many inventions. It makes really beautiful music. Across the street from the meeting house is the US Mint and the National Constitution Center. 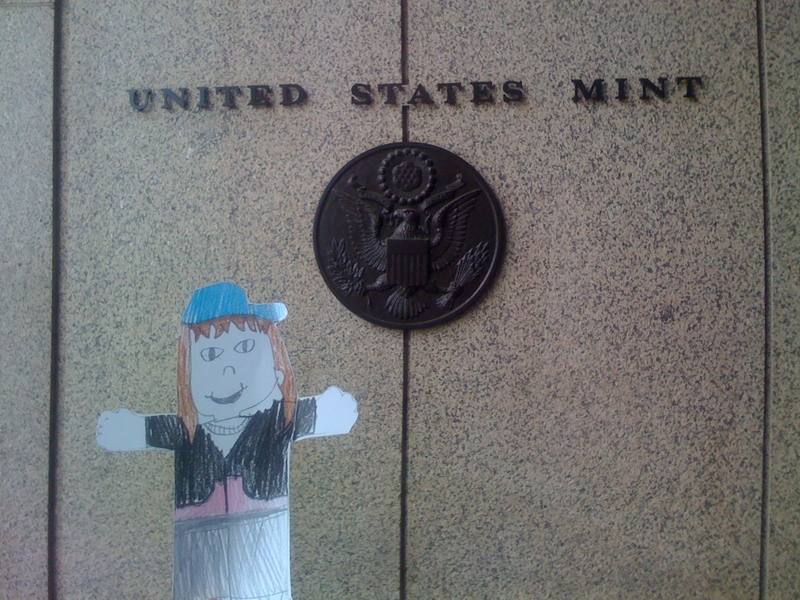 We couldn't take pictures in the Mint, but it was really cool to watch them make coins. They were making pennies the day we were there. Our penny adventures continued! 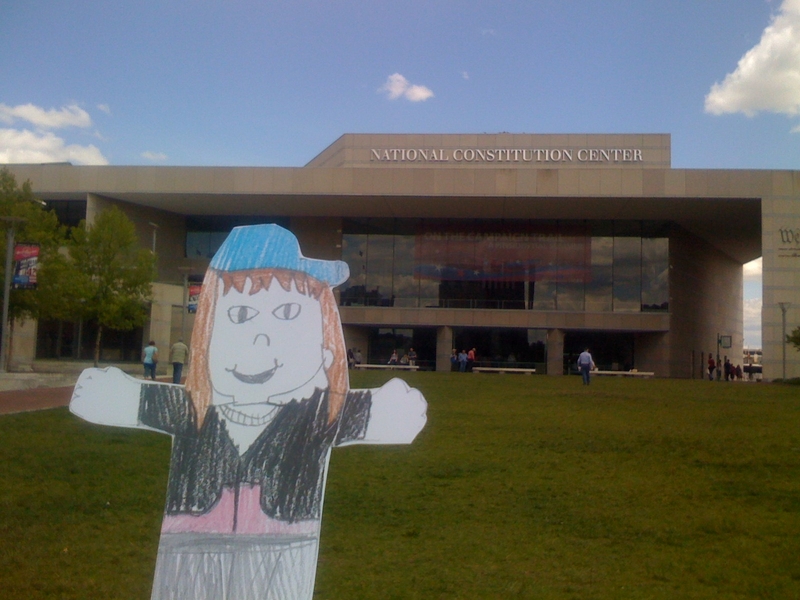 The National Constitution Center was just built in 2000 and it is the only museum in the United States dedicated solely to the Constitution. At the time we were there, we got to see exhibits about the Constitution, the Bill of Rights and how the Constitution has changed throughout the history of the United States. It was really interesting and fun. 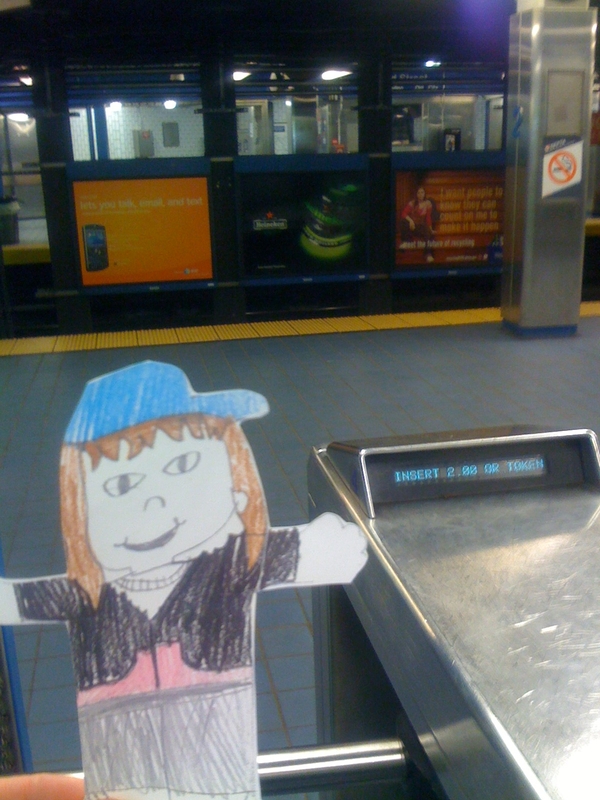 We saved the most historic places in the city for last, but before we walked over to them, Gloria wanted me to see a SEPTA subway station. We walked down underground to the subway station. It was a little scary, but I it was really cool too. All of those trains running for miles underneath the city. security but it was really worth it. The Bell is a lot bigger than I thought it would be. 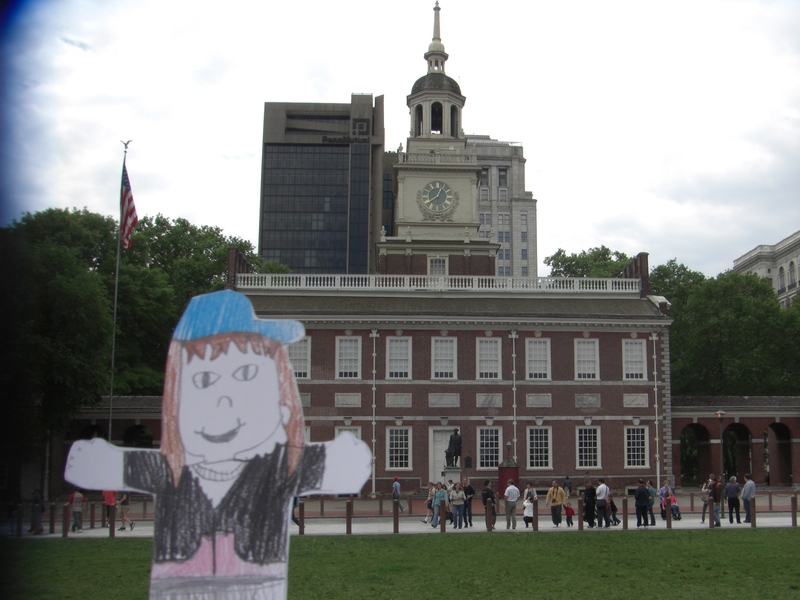 Independence Hall is very impressive. 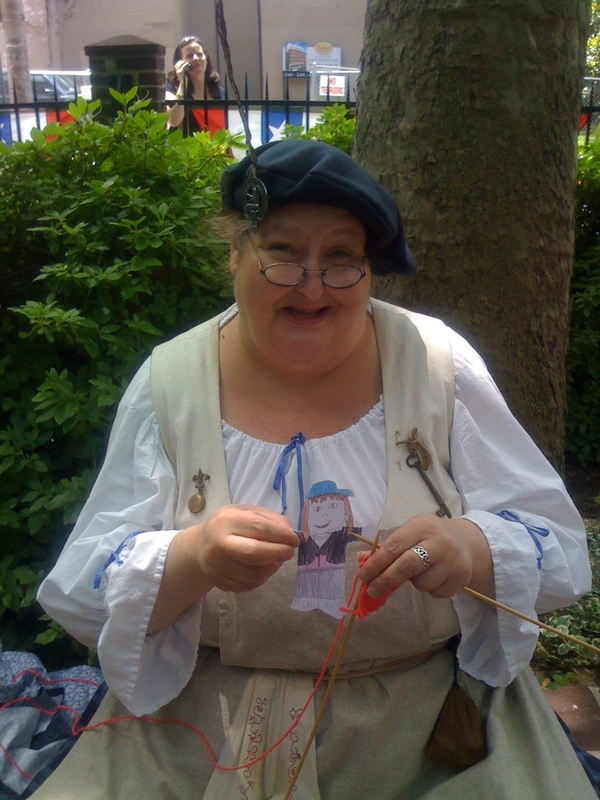 It looks just like it did in Colonial times. It was very cool to stand in the same room where they signed the Declaration of Independence. Wow, we had a very full day and got to see a lot of interesting and fun places. I was really tired, but I couldn't wait for the next day. 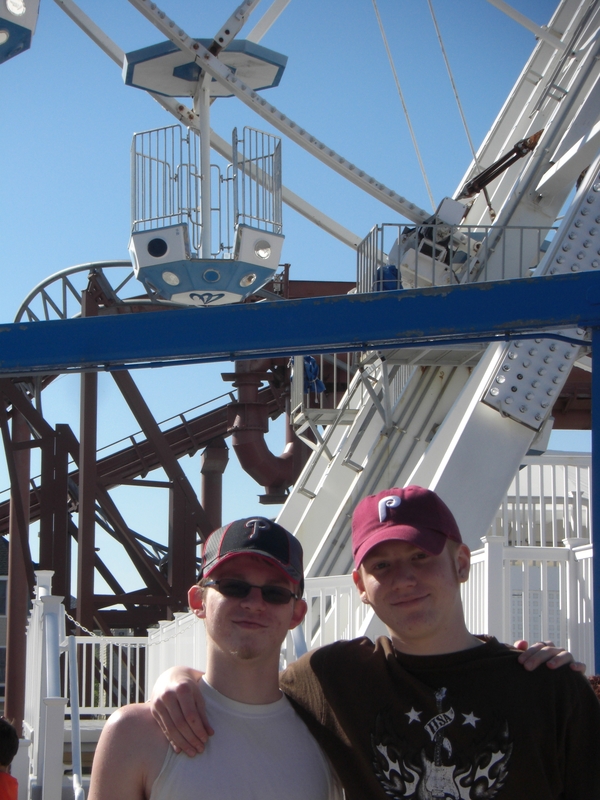 We were going down the shore with Gloria's sons, Drew and Sean. 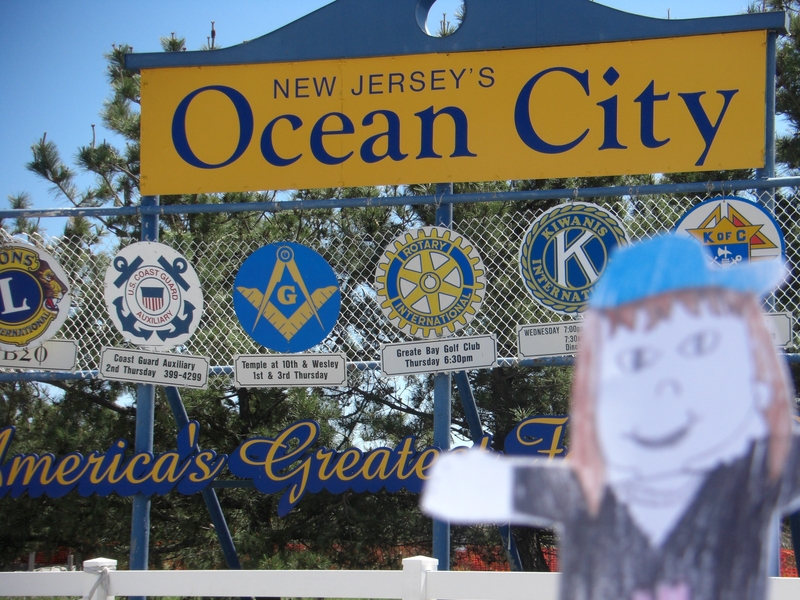 We went to Ocean City, New Jersey. It is in Southern New Jersey. Gloria explained to me that New Jersey residents are either from North Jersey, Central Jersey or South Jersey. They say this because all three areas of the state are very different. North Jersey is very industrial and suburbs of New York. South Jersey is a lot of suburbs of Philadelphia and is more agricultural. Central Jersey is a combination of the other two. 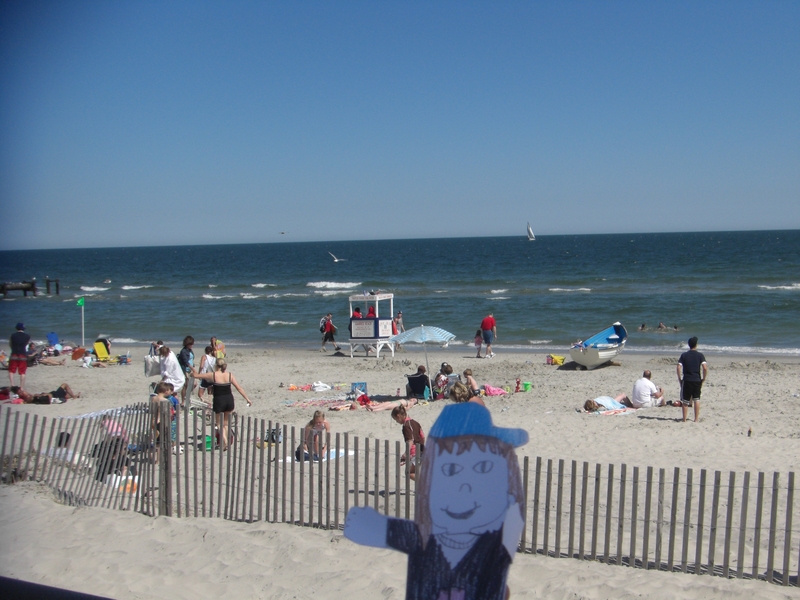 Ocean City is south of Atlantic City and is on an island. The drive down to the shore was fun. I got to meet and talk to Drew and Sean. For teenagers, they are really cool and funny. We did a lot of very fun things. It was a very sunny day and there were a lot of people on the beach and the boardwalk. We went on the beach for a little while, but the water was still too cold to go into the waves. We walked on the boardwalk, had pizza and french fries that were really good. We stopped in the arcade and played skeeball. There is a part of the boardwalk that has rides. We didn't ride any because the ones that were not too scary for me were too little for Drew and Sean. It was fun watching everyone else on the rides. 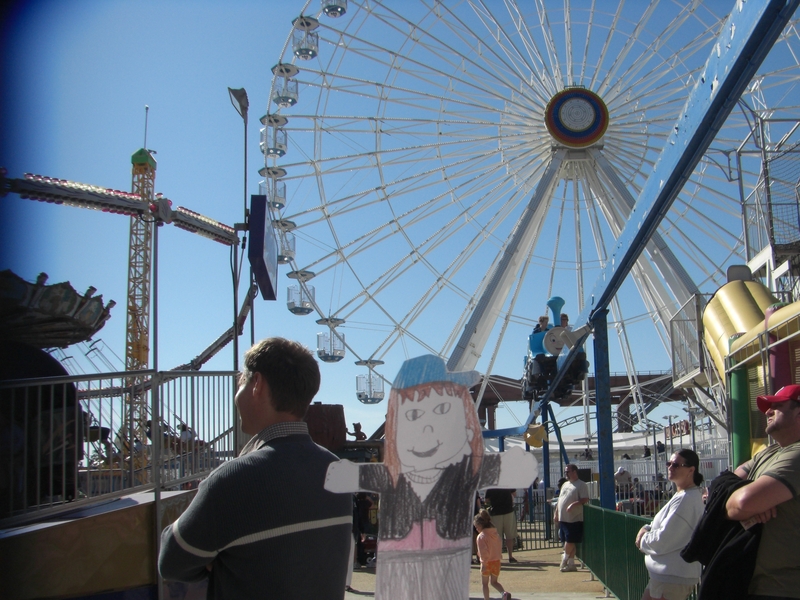 Gloria told me stories about when Drew and Sean were little and the rides they used to ride on this same boardwalk. A lot of the rides were the same and we giggled about how silly it would be to see them trying to ride them now. Drew and Sean's grandmother has a house in Ocean City so they have spent almost every summer at the shore. 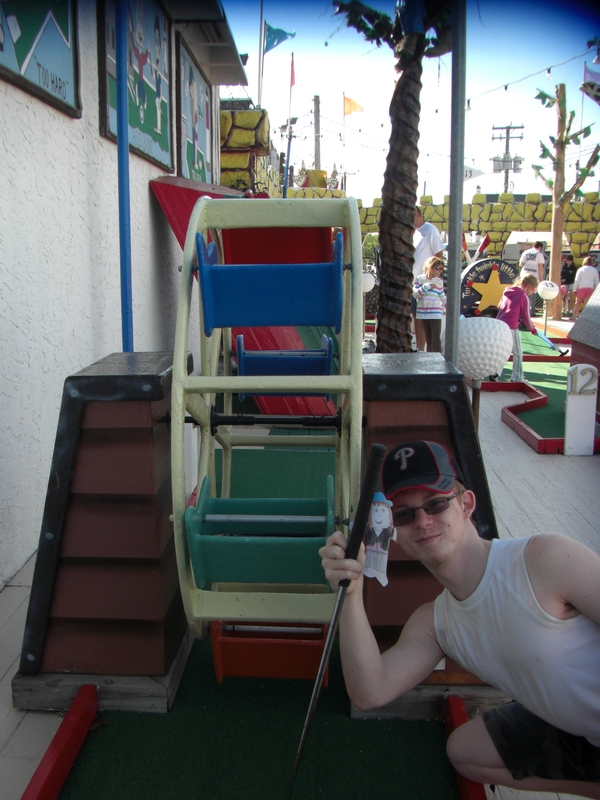 The last thing we did before heading back home was to play miniature golf. I actually made a hole in one! 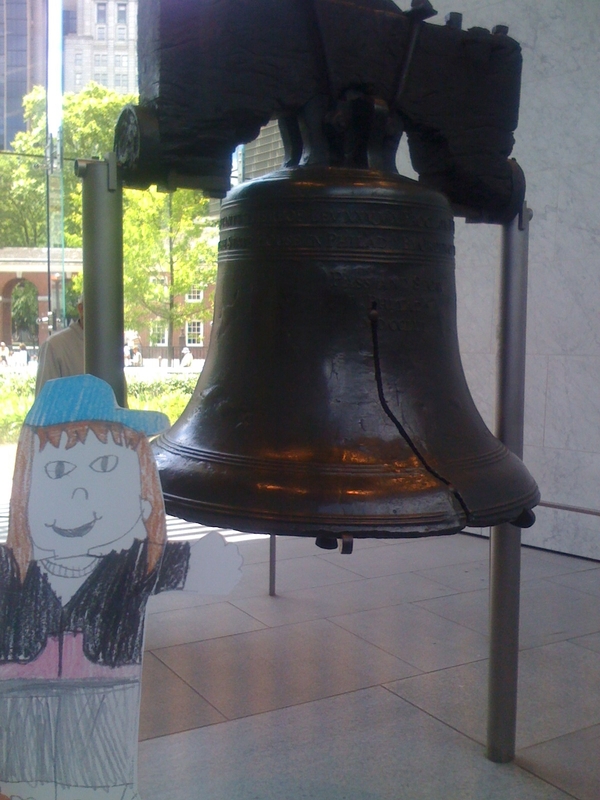 I had a great visit to Philadelphia! There was so much more that I wanted to see, but Gloria promised I can come back anytime I want. I can't wait! I am a Military Brat …. My hometown is nowhere, my friends are everywhere. I grew up with the knowledge that home is where the heart is and the family…. Mobility is my way of life. Some would wonder about roots, yet they are as deep and strong as the mighty oak. I sink them quickly, absorbing all an area offers and hopefully, giving enrichment in return. Travel has taught me to be open. Shaking hands with the universe, I find brotherhood in all men. Farewells are never easy. Yet, even in sorrow comes strength and ability to face tomorrow with anticipation….if when we leave one place, I feel that half my world is left behind. I also know that the other half is waiting to be met. Friendships are formed in hours and kept for decades. I will never grow up with someone, but I will mature with many. Be it inevitable that paths part, there is constant hope that they will meet again. 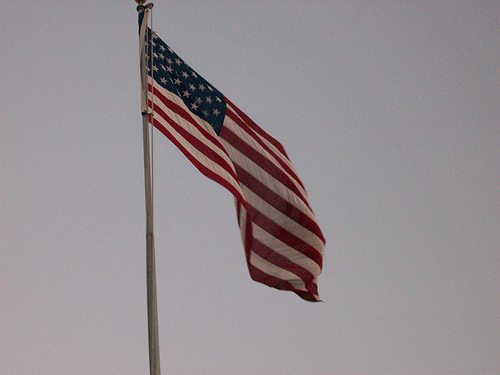 Love of country, respect and pride fill my being when Old Glory passes in review. When I stand to honor that flag, so also do I stand in honor of all soldiers, and most especially, to the parents whose lives created mine. Because of this, I have shared in the rich heritage of Military life. I try every day by spreading smiles, appreciation, and putting a little "gratitude in my attitude". I offer random acts of kindness and help whenever possible to whomever possible. But all of these things are just part of my character, ingrained in me since childhood as the right thing to do. The things that I have tried to instill in my children so that they too will feel the need, the wonder and the joy of helping others and making their small mark on the world. What decisions have you made that you would change? And would they really have created as much of a change as you think? Those are the questions. The answers should be yes and maybe. If it's not than you probably made the right decision in the first place. The consequences of almost all decisions, except maybe children, suicide or something that lands you in jail, can generally be changed by choosing to make a better decision now. You also have to remember that we make decisions based on what we know and who we are at the time. Thus, there really are few "bad" decisions, only ones that change your path in life, no matter how subtle. The goal is to then look at the new path, decide if is the one you want to take or is there one less rocky or more scenic (unless you want rocks and urban sprawl) and begin turning towards that path. Sometimes you may have to walk parallel to it until it merges, but with focus, faith and heart, you get on it eventually. I'm living proof. I made a lot of self-destructive decisions that not only impacted me but those around me. It took a very long time and a lot of very painful soul searching to understand what I was doing and why (not to mention some good medications), but once I began to start seeing it, I was able to look at myself in a mirror again without the horror, grief and guilt I used to see. 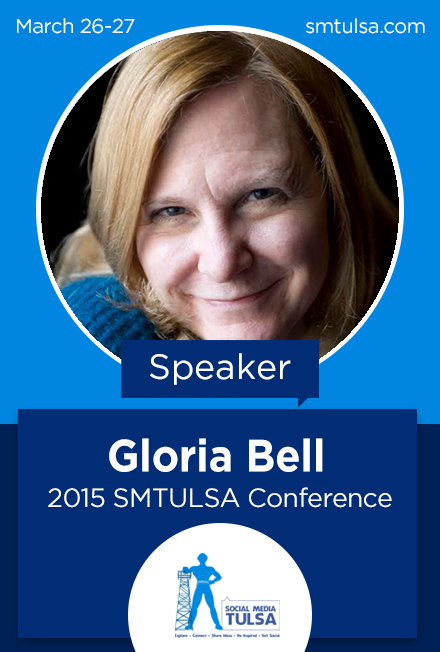 I don't believe that any of us ever really "get there", no matter what decisions we make. That is why life has to be lived as a joyous adventure to be explored and enjoyed. So if you are not happy with the way some of your decisions turned out, it is up to you to decide is making the changes to the consequences of those decisions worth it to you. If so, you begin the soul-searching that will reveal the steps you need to take to get back on the path you want to be following. And never underestimate the power of prayer, no matter what you do or don't still believe, the stillness and quiet of unloading your soul to a higher power (yes, AA inspired, been there, done that) makes finding what you are looking for much easier. So, the goal is to try and make understandable, well-reasoned, educated decisions, but at the times you don't, it is not the end of the world, you just have to make a decision to change your original decision.